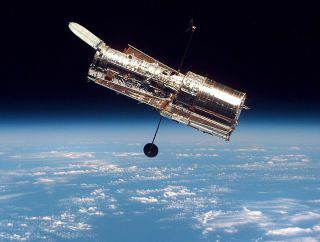 The Hubble Space Telescope is one mission that was recommeded by the National Academy of Sciences' decadal survey. Official discussions have begun about which major astronomy missions should receive funding in the 2020s, but the makeup of the groups leading those discussions has fueled concerns in the astronomy community about a lack of race, gender and age diversity. At the 229th meeting of the American Astronomical Society (AAS), a town-hall-style session that allowed attendees to pose questions to the leaders of a committee that will make recommendations for the next decadal survey, a report that will deeply influence the path that U.S. astronomy will take in the 2020s. "I think it would behoove us to have a main committee that is more diverse in terms of underrepresented groups," said one audience member (who did not give his name). "And also I think it would probably be a good idea to at least consider having members who are early-stage or midstage career rather than late-stage career, as really they're the ones that are going to be invested in the outcome of the survey." The audience member was referring to the Committee on Astronomy and Astrophysics (CAA) formed by the National Academy of Sciences (NAS). The NAS is responsible for producing the Decadal Survey for astronomy and satrophysics, as well as other science disciplines (each report is given a unique title near the time of publication). The decadal survey makes recommendations for where federal funding for astronomy research should be focused. Marcia J. Rieke, a professor of astronomy at the University of Arizona and co-chair on the National Academy of Sciences Committee on Astrophysics, led a town-hall discussion about the upcoming Astronomy and Astrophysics 2020 Decadal Survey at the 229th AAS Meeting in Grapevine, Texas. Members of the U.S. Congress and funding agencies follow the recommendations of the decadal survey closely. Past decadal surveys have recommended investing in what eventually became the Hubble Space Telescope, the Chandra X-ray Telescope, the Spitzer Space Telescope and the James Webb Space Telescope (set to launch in 2018). The 2010 decadal survey recommended that a large chunk of the federal budget go toward the Wide Field Infrared Survey Telescope (WFIRST), which was approved as a mission in 2016, and is set to launch in the early to mid-2020s. There are currently four large-scale missions that NASA plans to submit for consideration to the 2020 decadal survey. The committee's midterm report was released earlier this year. The CAA is not the committee that produces the decadal survey, but the CAA does produce a set of recommendations for priorities and areas of investigation for the decadal survey committee. The CAA's recommendations are compiled by members of the astronomy and astrophysics community, who are organized into subpanels that represent different areas of research. This offers a way for scientist to get directly involved in creating those recommendations. The town hall was held to get feedback from the community about how they'd like to see the CAA recommendation process managed, and so the current CAA committee members can ensure that the community's interests are represented by the recommendations to the decadal survey committee. Answering questions from the audience were the CAA committee co-chairs Marcia J. Rieke, a professor of astronomy at University of Arizona, and Steven M. Ritz, director of the Santa Cruz Institute for Particle Physics. In the past, the CAA committee and subpanels have been dominated by members who are white, male and in the latter half of their careers, according to multiple audience members. (Rieke also confirmed this in her responses to those audience members.) The committees also tend to be dominated by people from the country's largest universities and institutions, some audience members pointed out, leaving the community of scientists who work at smaller research schools underrepresented. The first audience member who raised the question of diversity of the subpanels asked Rieke how the committee planned to "try to ensure that there's a much larger diversity in the committee itself?" Rieke responded by saying that "we tried very hard when we were composing the main committee and also all of the panels to try to have more diversity, to have the composition of the committees represent astronomers as a whole … There's no magic formula, we're just going to have to call the right people." The CAA and the subpanels are staffed on a volunteer basis, and Rieke said that even though they reached out to a diverse group of people and asked them to join, many declined. Rieke asked the community to encourage colleagues from minority groups to join the panel. Audience member Ethan Siegel, a science writer and former scientist, asked Rieke if the committee had considered offering some kind of incentive for members, particularly those in the earlier stages of their careers, such as scholarship funding to offset the time they would have to dedicate to the panel. Rieke said it was a tricky issue, since the committee need to keep its budget low (otherwise people might wonder why those funds weren't simply dedicated to research, she said), but she added that she hadn't considered the possibility of compensation for members, and that it should be considered. Ritz said that on the question of "would we or should we" offer some kind of compensation for participation, "I think the answer is yes." He added, "And an interesting question is, for people who have been asked to do this and said they could not, I think we should try to identify why [they declined] and try to address that. So I appreciate your point." On the issue of bringing in more early-career scientists, Angie Wolfgang, a National Science Foundation postdoctoral fellow at Penn State University, raised concerns about whether it is feasible for postdoctoral researchers to commit to being on the CAA committee or subpanels. Postdoc appointments are usually given to people who have recently completed a Ph.D., and while these positions can lead to long-term employment, they typically last less than three years. Wolfgang said she thought it would be difficult for postdocs to commit to working on one of the CAA subpanels because members are asked to commit for a period of at least a year or for many years. Postdocs nearing the end of their appointment don't always know what their job status will be down the road, and without job security, some young researchers might find it difficult to make a long commitment to the CAA. Wolfgang also suggested that the CAA think about how to make it easier for more people to participate in the subpanels by, for example, asking for help on certain tasks that would not require a long commitment. The CAA could also consider hosting virtual meetings instead of asking panel members to travel multiple times per year to hold meetings in person, she said. Reike said there are opportunities for members of the community to appear at CAA meetings and make suggestions to the report without being a full member. "I think it is part of our goal with Astro2020 to make it easier for postdocs to do that," she said. Adam Burgasser, a professor of physics at the University of California San Diego, said he was "disappointed" that the 2010 decadal survey had only a brief section about diversity, and did not address how to make the fields of astronomy and astrophysics more accessible and welcoming to minority groups. The decadal committee's midterm assessment report, released in 2016, did not mention the progress made on issues of diversity, he said. "I'd like to ask that this committee, this review, put a little more effort and time and commitment into having those aspects discussed in the final report," he said. "Because if we're going to talk about the future of science, we also have to talk about the future of our scientists."